Our host was Betty and this month's book was Michèle's choice, Half of a Yellow Sun by Chimamanda Ngozi Adichie. All members were present including Linda via Skype. Betty provided lovely hors d'oeuvres mini egg rolls and mini spanakopitas. We were also treated to a lovely cake with strawberries and blueberries. 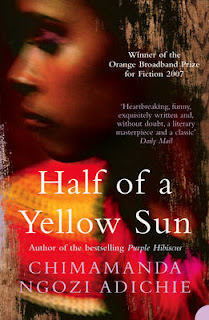 Half of a Yellow Sun is a story of several persons of the christian Igbo group in Nigeria, a young servant boy named Ugwu, Odenigbo a mathematics professor, twin sisters Olanna who lives with Odenigbo and Kainene and her white lover Richard. There are also many other characters in the tale. Their stories become intertwined as the civil war evolves. Many members found the story a difficult read, and some felt a sense of dread as they read it. As the story progresses we find out more and more about the cruelty and conflict that caused death and famine. Several members pointed out the difference between the Igbo people represented by the young servant boy Ugwu and the "elite" represented by Odenigbo and his university friends. The contrast is very evident and the naivety of the educated stands out in the discussions about independence in Odenigbo's dinner parties with friends, and the reality of civil war as it takes its toll . We discussed how Ms. Adichie is good at describing the atmosphere and the importance of food whether it is in Odenigbo's home and his dinner parties or in Ugwu's mother's home in his home village. We noted the importance that food has in the story from the abundance available before the war began to the famine the lack of food created. She created in both circumstances a sense of place and what life was about in both worlds. We also discussed Kainene and Richard's relationship and all felt that Richard was a weak man. There was consensus that Kainene was a strong woman who had chosen a weak man. We also discussed why Richard was in Nigeria, why had he moved there and many felt that we don't find out much about his political views or thoughts. Despite the difficult background of the Nigerian civil war members enjoyed the book and as with several books this year, the historical side of the story was much appreciated. In North America, we knew this war as the Biafran war and it was associated to famine. This book has given us the chance to learn more about the conflict and its impact on Africa. Those who would like to read more from Ms. Adichie, can read her first novel, Purple Hibiscus or her book of short stories, The Thing Around Your Neck.